A longtime resident of 12th Street between Avenue A and Avenue B recently passed away. A neighbor on the block shared the news. He was originally from Chile, and everyone called him Chile. He has lived on the block for decades, and he had two sweet dogs, Diego and Dante, who are now in need of a home. He had sold his apartment and was going to go back to Chile with his dogs in late October. However, the neighbor noted that he had health problems, and he wound up in the hospital just days before he was supposed to leave. He eventually went into palliative care. I feel sad that he didn't make it home to Chile. 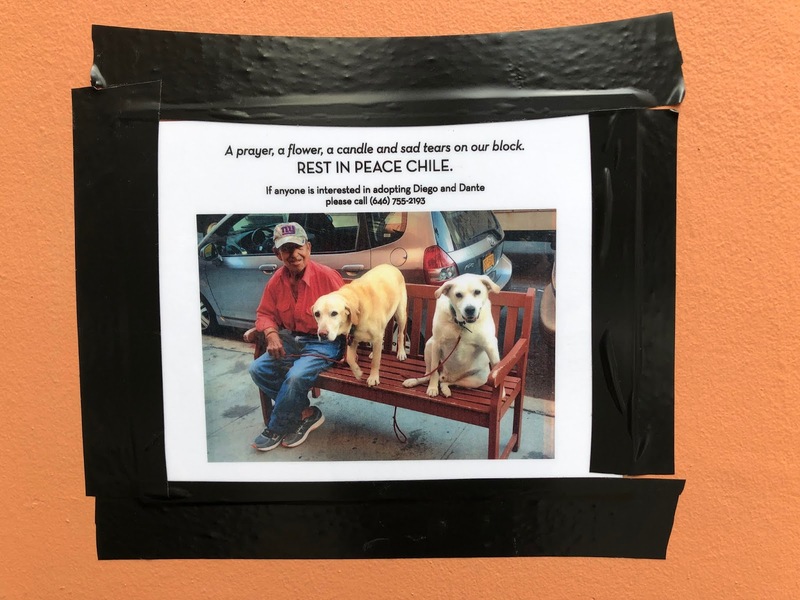 He had a cat, too, but he had already given the cat to a neighbor on the block because it was going to be hard enough for him to deal with getting the dogs from the plane to where he was going in Chile. They were his babies. He loved these dogs and would want them to go to a good home. 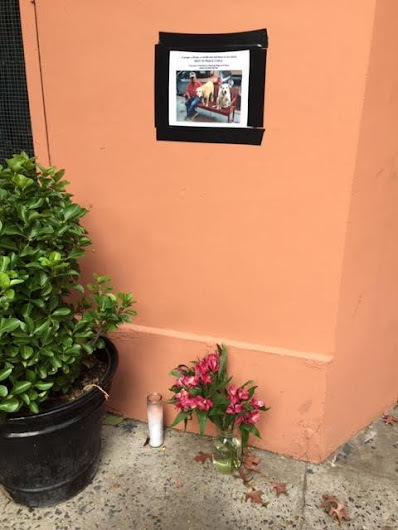 Everyone who walked down East 12th Street between A and B would have met him and Diego and Dante at some point. Animal; Haven is looking for a new home for the dogs now. Diego and Dante have both been adopted! Going to a new home in Brooklyn! He used to feed his dogs croissants outside the Open Pantry on 2nd Ave. Made me smle. Those dogs are sweeties. I wish I could take them but I already have a big dog who would not like two new roommates. EV, could you post a follow up to this if any news comes in on Diego and Dante? I think quite a few of us are worrying about them. I am so sorry to hear about his death. I will email this post to my dog loving friends. Maybe there is a shelter or rescue that could step in and help? Both dogs are now at Animal Haven. "Unknown," thanks for the update. I just donated online to Animal Haven. Sadly, our three cats would not be very happy adding to our home at present, but TG for Animal Haven and Chile's neighbors who helped get his dogs to a good shelter.